I'm wondering where the actual logic resists (which assembly and class). I'm going to utilize this functionality by defining a Sitecore task for this procedure. Of course, I'm familiar with Sitecore documentation about Marketing Automation Operations API, but I would like to see the original solution here :) + maybe I can use some already existing method for that. So, I don't need to maintain my own code. The actual logic for where contacts are enrolled into Automation Plans is contained in the Sitecore.Marketing.Automation.Client.dll. 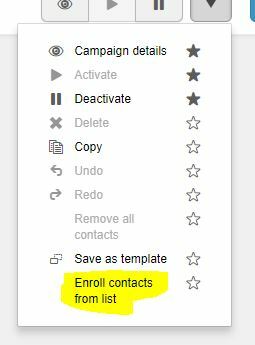 The name space to look for Sitecore.Marketing.Automation.Client.Controllers.AutomationPlansController.Enroll which calls a private method. That private method does the work of seeding the list with contacts from a list. Not the answer you're looking for? Browse other questions tagged xconnect sitecore-api marketing-automation or ask your own question.